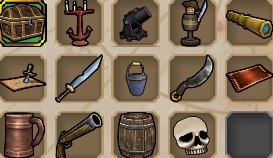 We all know about the fantastic sink which is my favorite item, so far. I want to talk about all the other furniture items. These items are the ones that make any added details to your Pirate101 housing. I have posted about the fantastic sofas and chairs but I want to talk about details. These items consist of books, candles and those much needed items to place on tables to add that detail of a Pirate living in the house. 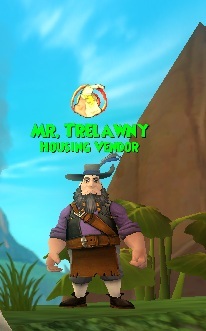 So far I have found housing venders in Skull Island, Rapa Nui, Flotsam, Port Regal and Mooshu. I am still on the hunt searching each area to see if there are any more. Each of these venders sell some items we have all seen before and then they have these items that are unique to Pirate101. In this first segment I will talk about the really fun detail items from Skull Island vender. Decorations and wall hangings add that much needed detail to the inside of the house. 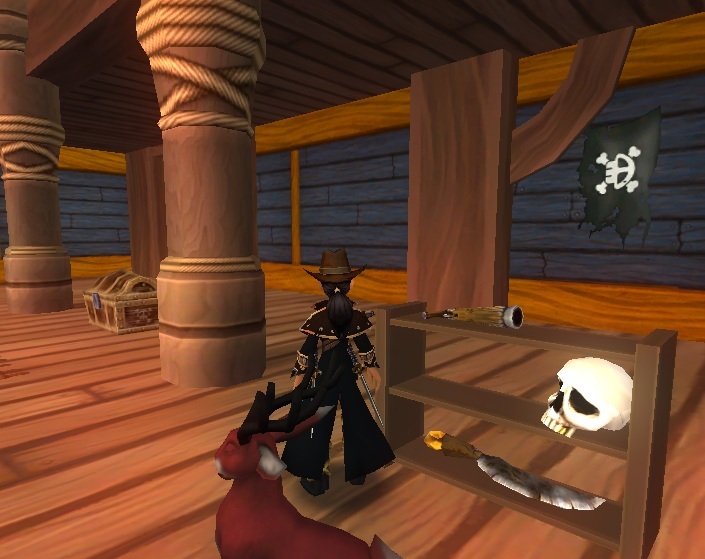 Details such as ship wheel and shark teeth wall hangings to treasure chests and weapons to place on shelves. There is even a map with a x marks the spot to place on top of desk for a Pirate to plan out that treasure hunting adventure. 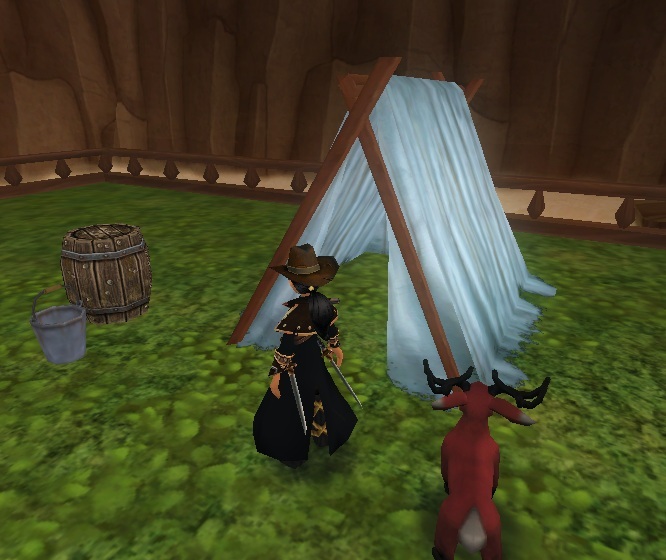 Outdoor items are statues and this amazing detailed draped A framed tent. You can see that the look of the fabric is so detailed that it feels so real. I added a barrel and a old metal bucket for the details needed to complete this little camping area. Hope all my readers enjoyed this first segment on housing details for Pirate101. Until next time, happy house decorating. 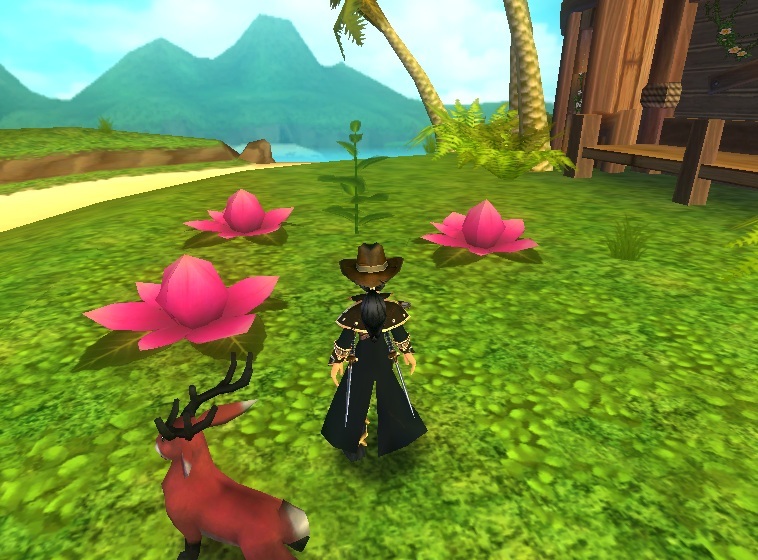 I just noticed your companion/pet - what is it, and how do you get it? That is the Jackalope. I won him in the haunted skyway in Cool Ranch. It's a pet. Paige, you seen any house glitches like w101?